A Financial Literacy Event at the New York Stock Exchange By Vicki Fenton - The Eve Fenton Love-All Foundation, Inc.
On Wednesday, December 9, 2008, the Eve Fenton Love-All foundation hosted a Financial Literacy Outreach Event at the New York Stock Exchange, which proved to be a huge success for Baruch College students. The Divine Gift to the students is the key to accomplishing their goals for the future. A thank you is extended to one and all, especially Murray Teitelbaum, NYSE Director of Education, Daniel Kamelhar of Baruch College and our very own financial advisor, Bill Dobrow of Ameriprise Corporation, and all those who took the time by volunteering their participation in this great financial literacy enlightenment endeavor. 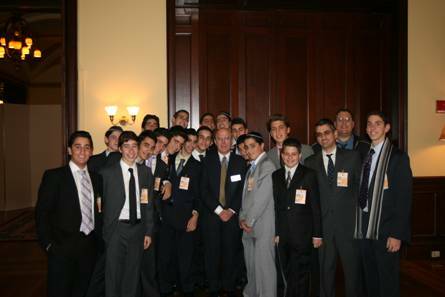 the Eve Fenton Love-All Foundation Inc.
On Tuesday December 9th 2008 a group of students from Magen David High School in conjunction with Baruch College had an opportunity to experience a program in financial awareness. This program was organized through the Eve Fenton Love- All Foundation to make high school seniors more aware of all the financial risks that surround them as they enter the real world. The program was run at the New York Stock Exchange with the help from the educational coordinator Murray Teitelbaum who was able to organize an amazing program which allowed them to get a real feel of what goes on in the NYSE building. The program started off with Mr. Bill Dobrow, who is a representative for Ameriprize Corporation. He spoke to the students all about understanding all the different aspects of spending and saving. Topics discussed with the students were credit, savings (for life & college) and investing (stocks and bonds). Students had the opportunity to ask questions and enhance their financial literacy to Mr. Dobrow directly. As part of this program students were split into two groups. The first group had the opportunity to walk on the trading floor and they were privileged to meet with FOX Business and hear from Nicole Petallides who is a reporter for FOX Business. She spoke to the students and explained to them how it is her job to report any breaking to news to all the people watching at home as quickly and understandably as possible. The second group had the privilege to walk on the observation deck and meet up with Bob Pisani of CNBC, who spoke to the students about how he also reports news to people watching at home. The group of students used this day to prepare themselves for the real world and to help them understand the importance of being more financially literate in these coming times. They better understood that the Wall Street of the past is not the Wall Street of the future. This was all done with the help of the Eve Fenton Love-All Foundation, who tries to help promote financial literacy in the coming generations and to try to prevent a repetition of problems which have surfaced in the recent times.